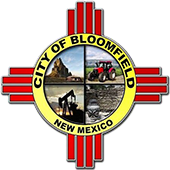 Bloomfield Police Department is accredited with the New Mexico Law Enforcement Professional Standards Council. This accreditation has been in place since 2007. The Bloomfield Police Department will render the highest level of service in a professional and ethical manner, working in cooperation with the community to solve problems related to crime and social disorder, thereby ensuring safety and improving the quality of life. We value our community to protect lives and property. We are dedicated to providing the highest quality of service to protect the citizens of Bloomfield. We value honesty, integrity, and truthfulness. We recognize that honesty, integrity, and truthfulness are the foundations of our profession. We will constantly strive to maintain the highest standards, recognizing their importance in upholding our credibility within the law enforcement profession and the community we serve. We value professionalism, cultural diversity, and the rights of all individuals. We are dedicated to performing our duties in accordance with the constitution, state laws, and city ordinances while protecting the rights of all individuals. We will build from the strength provided by cultural diversity within the department and the community to ensure the fair and equitable treatment of all. We value community involvement on all issues relating to a safe and secure city. We respond to the needs of the community; therefore, the community should have significant involvement in achieving a safe and secure city. Using Community Policing, we will continually seek mutual cooperation on all community-related problems, reducing the threat of crime, and enhancing the quality of life. We value employees, the department’s most valuable resource. We are dedicated to building the foundation of the police department through fairness, respect, and equal opportunity provided to all employees. We are dedicated to providing an enjoyable work environment through open and honest communications, quality leadership, up-to-date training, and mutual support.